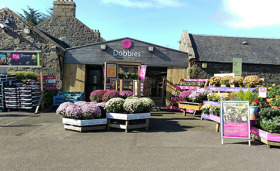 Dobbies Garden Centres has agreed the sale of its two smallest centres – Kinross and Cumbernauld – to family-run Caulders Garden Centres. Dobbies – which bought six Wyevale centres last year, including Woodcote Green – said the sale of these two smaller centres is in line with a strategic growth plan, as it focuses on building a destination garden centre business. The deal sees independent group Caulders, which is run by Colin and Mandy Barrie, expand its portfolio to seven centres across central Scotland. The business has been trading for nearly 20 years, having been established with a centre in Mugdock Country Park in East Dunbartonshire. Its most recent acquisition was Cupar Garden Centre in Fife, which the Barries bought in 2017. Under the terms of the deal, all 43 Dobbies team members at the Kinross and Cumbernauld centres will transfer across to Caulders. Caulders managing director Colin Barrie said: “We are looking forward to welcoming our new team members to the Caulders family, and to working with them to develop these fantastic garden centres over the years to come. The sale is expected to complete during February, with the centres reopening as Caulders Garden Centres soon after. Will 2009 be ‘The Year of the Begonia’?